On a day when US and European auto stocks rallied (at the expense of shares of their Chinese competitors) following President Trump's tweet (since complicated by comments from Kudlow and Mnuchin) that China might soon agree to reverse its tariffs on US-made cars, Morgan Stanley has published a report that further justifies the short-term bull case for autos while possibly infuriating President Trump. After Ford successfully spun its latest "restructuring" as a jobs-neutral, union-endorsed shifting of employees from one factory to another, one analyst at Morgan Stanley is calling "bulls***", writing in a report published Monday that the Detroit automaker could soon announce an even larger round of job cuts than rival GM, which famously incurred the wrath of President Trump last week when it announced that it planned to shutter five North American factories and fire 14,700 US workers (the job cuts would affect both hourly blue-collar workers as well as white-collar salaried workers). 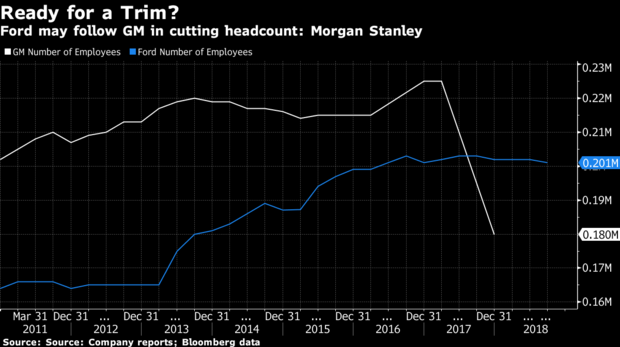 MS analyst Adam Jonas said that as part of Ford's $11 billion 'restructuring', Morgan Stanley expects the car maker could cut as many as 25,000 jobs (though the bulk of the cuts would likely focus on its profit-draining European operations). "We estimate a large portion of Ford’s restructuring actions will be focused on Ford Europe, a business we currently value at negative $7 billion," Jonas wrote. "But we also expect a significant restructuring effort in North America, involving significant numbers of both salaried and hourly UAW and CAW workers." Ford’s 70,000 salaried employees have been told they face unspecified job losses by the middle of next year as the automaker works through an "organizational redesign" aimed at creating a white-collar workforce "designed for speed," according to Karen Hampton, a spokeswoman. "These actions will come largely outside of North America," Hampton said of Ford’s restructuring. "All of this work is ongoing and publishing a job-reduction figure at this point would be pure speculation." Ford announced last week that it would be slashing shifts at 2 US factories and moving workers elsewhere. Ford also is cutting shifts at two U.S. factories in the spring and transferring workers to plants building big SUVs and transmissions for pickups in moves that the automaker said will not result in job reductions. But the biggest risk here for US workers is that these cuts will likely be self-reinforcing, as rival automakers scramble to shrink their staff amid intensifying pressure for cost cutting. Jonas said other automakers will be forced to follow GM’s and Ford’s actions as the industry transforms, first to abandon factories building slow-selling sedans and ultimately to retool to build electric and self-driving vehicles. "We believe existential business model risk will be prioritized over near-term profits and cash return," Jonas wrote. "We still do not believe investor expectations have fully considered the near-term earnings risk." Of course, if China doesn't lower tariffs (and instead the US imposes tariffs on cars made in Europe and Japan) this number wouldn't come close: That scenario would be significantly worse.